The Dragon Series is Back, and Better Than Ever!!! If you are a fan of the Dragon/Guardian series, then you will be very happy with this book. It has everything you expect from the writing style of this series and Constantine finally gets his story! It really helps tie together some of the mystery behind Constantine and Baltic's relationship too. 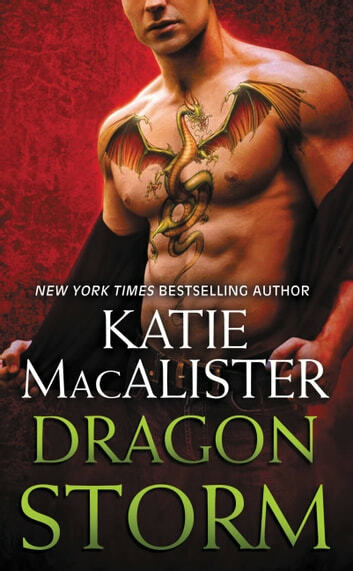 You also get some nice interspersing of all the other dragon/guardian characters, which for us die-hard Katie MacAlister fans feeds the need to know what is happening with everyone. For those of you who read the first book in the series (Dragon Fall - Aoife's and Kostya's book), this book is much better. You also get a bit more of a resolution between Aoife and Bee, than where we left off at the end of Dragon Fall. For those of you who are new to the Dragon/Guardian series, these are fun, quirky mystery/suspense novels that take you through the trials and tribulations of the different dragon septs and the mystical world that they live in. The first sets of the series are the Guardian books and they revolve around Aisling and Drake (the head of the Green Dragons). The next set of books in the series are the Silver Dragons Series, and they revolve around Gabriel and May. Then you go through the Light Dragon Series, which revolves around Baltic and Ysolde. The newest books in the series are single-title books Dragon Fall and now Dragon Storm. These books will make you laugh, cry, yell and scream, and everything in between - they are just fun reads and characters that you do not want to part from. You can read these books independently, but it probably helps tie some things together if you read the other books too. The good news is that once you read one, you really will want to read them all. This is actually a good book to start with, because it gives you a nice introduction to the rest of the cast and then I would suggest starting at the beginning of one of the different series sets that I outlined above. Happy reading! Constantine is my new favorite wyvern. Excellent character work in this one. Definitely worth a read! If you read Katie MacAlister's books, you will love this one. If you don't try it!!!!!! In Constantine's story, questions are answered and more are brought up. New characters and well known beloved characters bring another delightful book. Lots of laughs and suspense!!! No shortage of adventure, surprises, and romance! ~ 4 Dragon Storm Stars ~ Dragon Storm is book two in the Black Dragons series by Katie MacAlister. I do love me some dragons. Katie MacAlister won me over with her dragons with the Aisling Grey series, about the Green Dragons, from then on I have been in love with the world and quirky characters. Yes, it’s had it’s up’s and down’s as all series do, but I still can’t get enough of these dragons. Dragon Storm stood on it's own, but is best if you read these in order. It’s a mini series inside a larger one. Even if you have not had the pleasure of enjoy other books yet in this series or the other dragons, you will fall in love and want to devour all the books. This novel brought me back to what I LOVE about this series and what hooked me. It's got great fun characters to fall in love with, humor, comedy, secrets, surprises and romance. I love the banter all the characters have and Gary (comedy relief) reminded me so much of Jim from Aisling Grey series. Jim and all the others we have meet show up to add too the fun and surprises. I will say I’m glad someone finally told Aoife off. She needed a talking to. I didn’t love her in Dragon Fall and still don’t, but this story is not about her. I had fun with these two. Bee and Constantine are a nice pair, fit together, had nice chemistry and are both a little goofy. Constantine is defiantly a favorite. I loved seeing him get his chance and find someone to stand by him. Their is no shortage of adventure, plot twists, surprise, suspense and romance in Dragon Storm. This was one fun wacky silly ride. This novel is best for those that like a little quirky with their paranormal. I couldn't put this one down and will be adding it to my must own list. I can’t wait to read more.